Esther Cherrett comes from a proud line of midwives and was trained by her mother to take over the family calling. But when a scandal threatens all she holds dear, Esther takes a position as a teacher in the western mountains of Virginia instead. There she finds herself in the midst of a deadly family feud and courted by two men on opposite sides of the conflict. When it seems as though her past has followed her all the way into the mountains, all she wants is to run away again. In this gripping story of trust, deception, and bittersweet loss, a young woman learns the true meaning of choices of the heart. 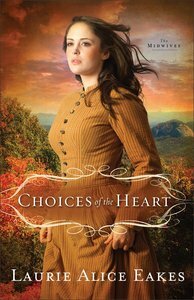 About "Choices of the Heart (#03 in Midwives Series)"
A colonial midwife is spirited away by a Scottish ship captain bent on revenge--will she make it home again with her heart intact? It's 1813 and all Phoebe Lee wants out of life is to practice midwifery in Loudon County, Virginia. When Belinda, her pregnant sister-in-law, presses Phoebe to accompany her onto a British privateer in order to cross the Atlantic and save her husband from an English prison, Phoebe tries to refuse, then finds herself kidnapped. Captain Rafe Docherty is a man in search of revenge. His ship is no place for women, but he needs Belinda in order to obtain information about the man who destroyed his family and his life. Between Belinda's whining and Phoebe's hostility, Rafe can't help but wonder if he made the right choice. Book 2 in The Midwives series, Heart's Safe Passage is a stirring tale of love, intrigue, and adventure on the high seas. Readers will feel the salt spray and the rolling waves as they journey with Laurie Alice Eakes's vivid characters on the treacherous path toward redemption. Laurie Alice Eakes is the author of Lady in the Mist, A Necessary Deception, and several other novels. She won a National Readers Choice Award for Best Regency in 2007 for Family Guardian. Laurie Alice writes full-time from her home in Texas, where she lives with her husband and sundry dogs and cats.